2 drawings on paper, laminated (1 sheet) : ink ; top image 4.5 x 6 in., bottom image 4.875 in. x 6 in., on sheet 9.3.78 x 6 in. Ink sketches of a softball game and a man seated on a toilet in the lavatory. 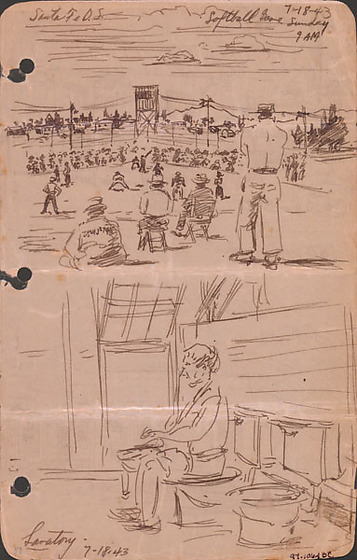 Top sketch of baseball game viewed from outfield where three men sit and one man stands in foreground with back to viewer ; players stand at positions as batter is at plate ; crowd behind homeplate ; fences, guard tower, buildings and distant mountain in background ; clouds sketched in sky. Bottom sketch of a man seated in profile on one of two toilets, facing left ; wooden wall behind toilets ; open window in background. Drawing 97.106.1BD on verso of same sheet. Written in black ink on top image, top left corner: Santa Fe D.S. Written in black ink on top image, top left corner: 7-18-43 / Softball Game Sunday / 9AM. Written in black ink on bottom image, bottom left corner: Lavatory, 7-18-43. Written in pencil, bottom left corner: 58.